The History Channel gave out in a sweepstakes to promote their program "Russia, Land of the Tsars" in 2003. The limited edition dolls portray important people in Russia's history. Only 200 of these were given out to third prize winners. 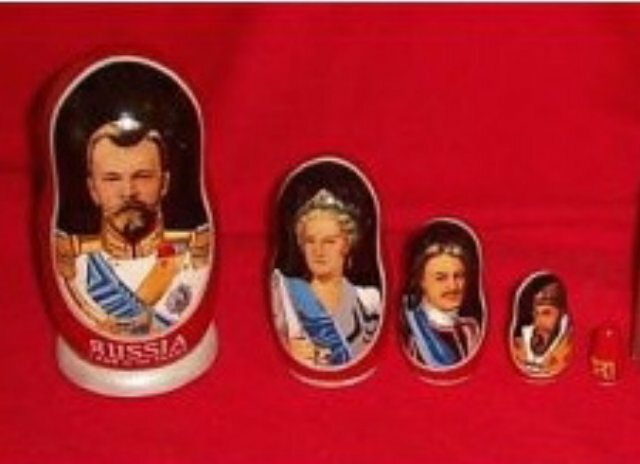 The dolls are Peter the Great, Catherine the Great, Ivan the Terrible, and Rasputin. The smallest doll does not portray a person but is painted all red with an "H" for the History Channel on the front. The portraits appear to be hand painted on each of the four largest dolls. This is a beautiful and rare set that will please any lover of Russian culture or doll collector.